The Arkansas Headwaters Recreation Area encompasses the first 150 miles of the Arkansas River and is home to some of the finest whitewater in the United States. 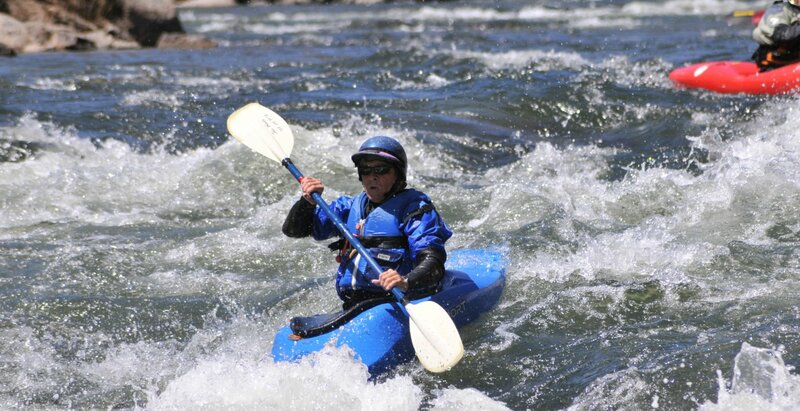 Kayakers seem to take over the towns of Buena Vista and Salida during the spring and summer months. Both towns offer world class whitewater parks that are centrally located and offer a variety of waves, holes, splat rocks and endless opportunities to play and challenge yourself at any river or skill level. Above, below, and in between the towns of Buena Vista and Salida are many miles of scenic river that offer everything from mild Class I and II sections to roaring Class IV and V rapids. The “Milk Run” and “Big Bend” are two of the more popular mellow sections that are ideal for beginner kayakers. North of Buena Vista is the “Numbers” which many kayakers call the best Class IV section in Colorado, and just above is the more challenging and Class V “Pine Creek” section. The stunningly scenic “Browns Canyon” is the most popular section of the Arkansas River and is located between Buena Vista and Salida. Further downstream kayakers enjoy the jaw dropping beauty of the Royal Gorge, which rivals Browns Canyon for most scenic and fun section of river.